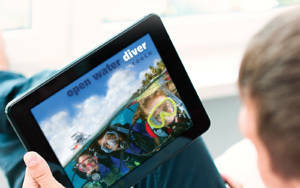 PADI Touch is the digital version of the PADI Open Water Diver Course. With this version you can do all the theory online, wherever you are, with any Apple iOS or Android device. You save at least one full day and have time for some further pleasure dives, relax or visiting the island when you are here in Malta. To apply for the Touch version we have to buy a code for you and you will receive an email from PADI (the international agency that issues the diving certification). You have to download the PADI APP, register yourself, choose the language and start the course. First you have to watch the video and read the manual, (you can do it even off line, if you leave the browser open), do the knowledge review at the end of each chapter (5 chapters), just in case connect you to the internet again, do the quizzes (4×10 questions each) and the final exam. At the end you will get a record from PADI with all the results, you can send it to us or print and bring here. At your arrival we will do a quick review and go straight into the water for the wet and fun part of the course. If you are confident with the skills, you can complete the course in 2 full days. The cost is €450.00 everything included, all the theory, land transport to the dive sites, full hire equipment, 5 confined water sessions, 4 open water sessions and certification fee. If you decide for the Touch version we need €80.00 deposit to buy the code, your full name and surname, date of birth and email address. To book your course or for any further information, email us at info@orangeshark.eu or fill our form.